Oil Capacity - .63 qt. Drive - A-section, V-belt engine to gear case; double roller chain to blade eccentric shaft; gears and roller chain to traction wheels; transmission has separate dog clutches to engage cutting blade and traction drive. Speed - Up to 135 ft. / min. Cutting Width - 18 in. Cutting Thickness - Adjustable up to 2.5"
18-in. Model - 356 lbs. 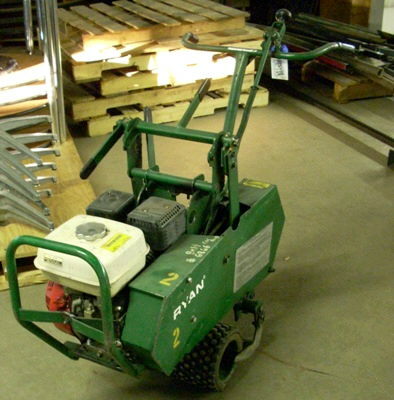 * Please call us with any questions about our sod cutter 18 inch power rentals in Burnsville MN, Rosemount MN, Apple Valley, Minneapolis, St Paul, Twin Cities, South Metro,and Dakota County.